Here at AutomotiveAddicts.com we take natural delight in visiting or viewing a garage full of exotic or sports cars just like any other automotive enthusiast. Today a garage door company based in Australia sent us an interesting infographic highlighting the most expensive car garages in the world starting with the famous Hamilton Scott En-Suite Sky Garage Apartment that you may have seen where his ‘car elevator’ is stuffed with a new Lamborghini Aventador. The infographic ends with Jay Leno’s Big Dog Garage, which we cannot even fathom or guess a price tag when you add up all of the vehicles he has stashed inside. 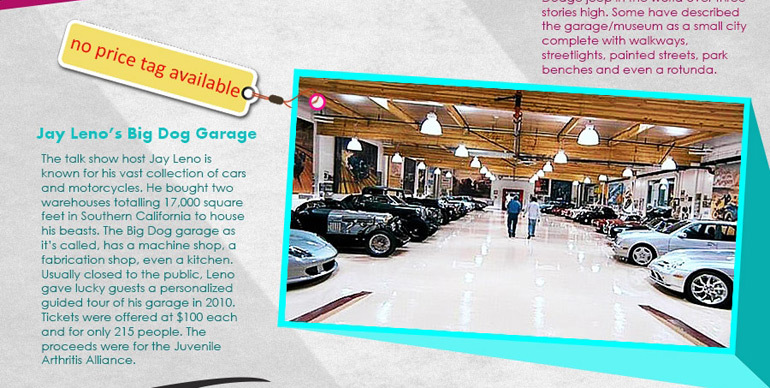 View the full infographic below of the most expensive car garages in the world.